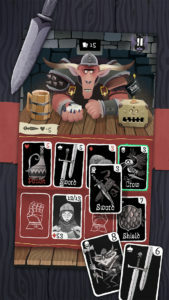 You clear the dungeon of 54 cards by using item-cards, slaying monsters and managing your inventory – which is pretty limited, forcing you to make strategic decisions. On each run, you can use five ability-cards to gain unique skills. As you play you’ll collect more gold, by which you can unlock 35 more ability-cards for new tactics. It’s very highly rated and has been nominated for several awards.